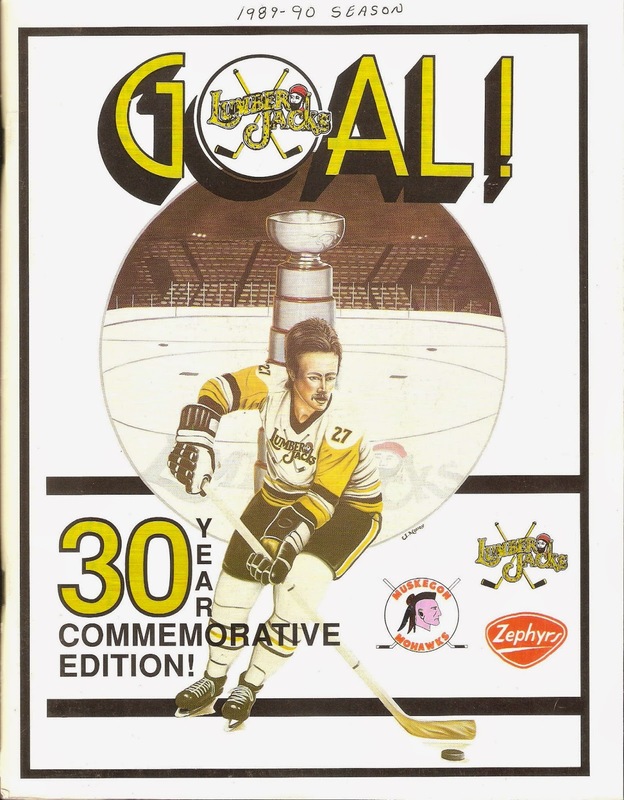 The Muskegon Lumberjacks were coming off their second Turner Cup championship of the 1980s. Ever since Larry Gordon purchased the franchise in 1984, the Lumberjacks were at or near the top of the league standings, winning 50+ games every year but on in that stretch. The Lumberjacks were the primary affiliate of the Pittsburgh Penguins. 1989-90 was no different, as Blair MacDonald's team once again won the Huber Trophy as regular season champions. Their 55-21-6 record was four points behind second place Kalamazoo and just two ahead of West Division champ Indianapolis. Muskegon was tied for the league lead in goal-scoring, pumping in 389 goals (tied with Kalamazoo). Dave Michayluk led the team with 51 goals and 102 points. Two players had 40+ goals (Scott Gruhl and Perry Ganchar) and three others had at least 25. The Lumberjacks allowed the second-fewest goals in the league that season, as only 304 pucks crossed the goal line. Blair MacDonald used three different goaltenders: Bruce Racine, Chris Clifford and Frank Pietrangelo. Racine was the #1 goalie on the team, going 29-15-4 with a 3.75 GAA in 49 games. Racine and Clifford alternated starts in the playoffs. Muskegon made quick work of the Fort Wayne Komets, sweeping them aside in four straight. In the second round, the Lumberjacks were taken to the limit by their archrivals, the Kalamazoo Wings, before advancing to their second straight Turner Cup Finals. Once there, they ran into a red-hot Indianapolis Ice. The Ice were the primary affiliate of the Chicago Blackhawks, and just missed the top record in the IHL. In the Finals, the Ice swept aside the defending champs in four straight to win their only Turner Cup title. Another great-looking program, 104 pages loaded with advertisements and articles. There is also a roster sheet featuring up-to-date stats for the Lumberjacks and that night's opponent, the Flint Spirits. The program also has that night's ticket stub and a season schedule glued to a blank lineup sheet in the program. According to the writing on the program, the Lumberjacks blew out the Spirits, 10-3, which clinched the Huber Trophy. Local Ads include Viking Foods and Shur-Fine Groceries (Very colorful, very 1980s Viking Foods logo), Maxis' Restaurant and Nite Spot and Betten Chevrolet-Geo.